The Cobblers. 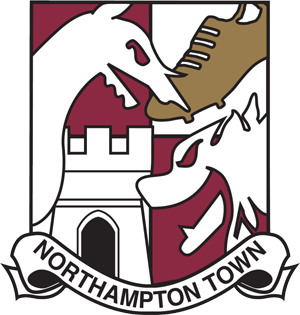 Northampton Town Cobblers are 15 miles south of where my mother was born (Kettering, England). I've been playing a bit of the FIFA 10 and I was happy to find three leagues in England represented. 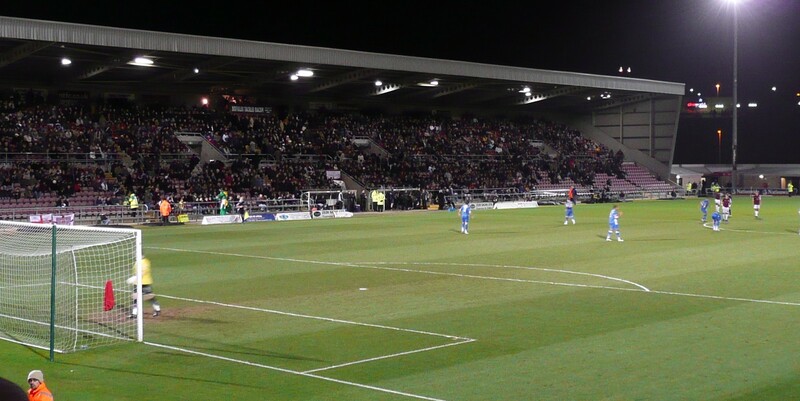 The Cobblers were in the third league last year (which, I think this year is going to be the nPower League), which would be kinda similar to Double A minor league baseball here in the US. I say "kinda" because the more I look at the info page on the Cobblers the more I start to think; "Does everyone in England play soccer?". 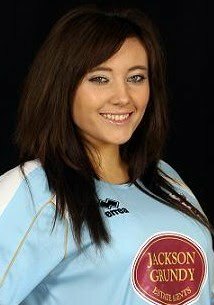 Even a third tier team like the Cobblers have a Reserve team (guys the stay in shape playing other reserves), a youth team, a ladies team, the Northampton Town Girls under 12 Player Development Squad, a multidisabled team, and finally... a fan team. 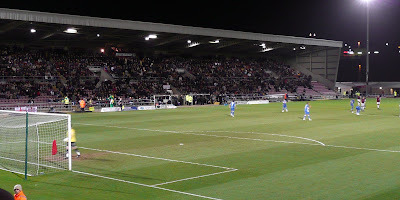 Their stadium; Sixfields is beautiful. It's as good as any University stadium I've seen in the US. It seats about five thousand. Smaller then the Columbus Crew stadium, but somehow... more elegant. It's hard to wrap my head around all this really. With all the soccer hullaballu going on around the WC, it's exciting to think about planning a trip to England this fall to watch me some Cobbler football. Heck, they may even throw a 'random American fan day' for me, if they can fit it in. They have events for everything else. Click HERE to find out everything you want to know about Cobbler Football. So, back to FIFA 10 (PS3 version). Excellent, excellent game. Been playing a lot this July 4th weekend. There is so much in this sports game, it's hard to beat. Live leagues; meaning they will compare what you do to what 'really' happened. In real time. You can create a pro player. Make your own tournaments. There are more teams and leagues then any game I've ever seen. It is mind boggling. It makes Madden look silly. I'm up to playing on the second lowest difficulty. 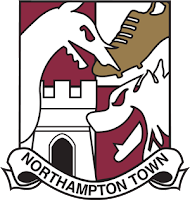 I created a league of 32 strong teams to pit against my Northampton Town. I'm toiling around against the likes of Roma, Chelsea, Barcelona. My last bit of message here is about the bigger picture in regards to English Football... It's not going anywhere. Calm down. It is so woven into the fabric of your culture. While you may not be the best team year in year out. You will always have a great team to pull for for a long, long time. The very existence of Northampton proves that.